Kolkata, April 1: Kolkata’s renowned festival – Durga Puja – is celebrated with fervour around the world and now another crown is going to be added in its kitty. According to Sangeet Natak Akademi, Durga Puja is India’s official nomination for UNESCO’s 2020 list of cultural institutions from around the world that require protection and preservation. 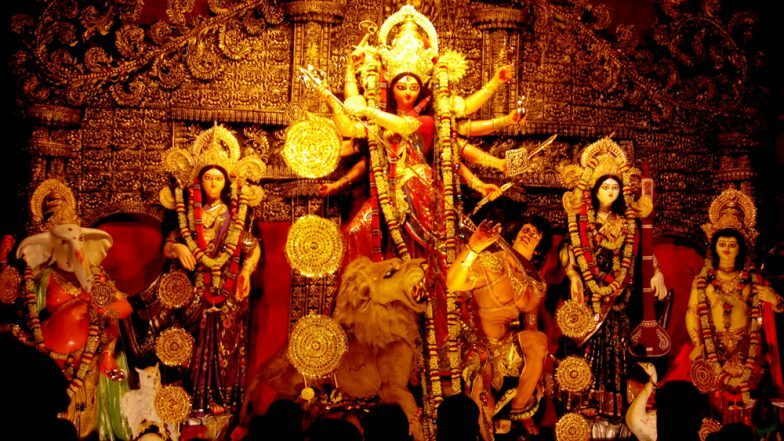 The autonomous body under the Union ministry of culture has nominated Durga Puja as their official entry for the UNESCO list of the Intangible Cultural Heritage of Humanity. As per to the Akademi website, India currently has 13 cultural traditions under the UNESCO list. Sindoor Khela on Vijaydashami 2018: Here's How Women Across India Marked the Last Day of Durga Puja This Year with Vermilion, View Pics. Earlier in 2016, yoga was added to the list in 2016, while Kumbh Mela became part of world heritage in 2017. For 2018, ‘Sowa-Rigpa’ commonly known as the Tibetan system of medicine was nominated by the Union Ministry. Briefing more about the development, Professor Tapati Guha Thakuta said, as reported by Hindustan Times, “Kolkata’s Durga Puja has developed a special artistic profile, which no other festival has with modern artists and designers coming together to produce new urban art. This gives it a unique dimension.” Prof Thakuta led a five-member research team in preparing the nomination dossier for the Akademi. It is to be known that each year Durga Puja is celebrated with joy during the Hindu calendar of Aswin (September-October) each year for ten long days. During the entire period, people worship the nine different avatars of Hindu Goddess Durga, and the entire city of Kolkata is decorated.